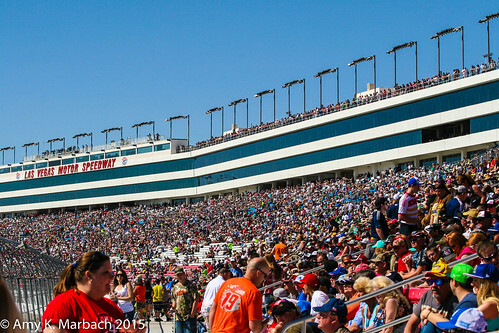 Well here it is- the annual Vegas Racecation Diary with pictures! Sorry for the delay- I had some fairly major issues with my laptop…but those have all been ironed out. Thank you for your patience and I hope that you like the pictures Misty and I have to share with you from the great time we had at the Kobalt 400 in Las Vegas. Also- stay tune next week we will be announcing a contest for some cool Tony Stewart prizes. Qualified: 14th (after wrecking a car within minutes during first practice and moving to a backup car). Points After Pocono: 10th in the points standings! Tony is now 121 points out of first place in the standings! We are 2 points ahead of 11th currently so we do not need the wild card. However Tony does have 1 win for the wild card berth should he need it. As a Tony Stewart fan, I went into the 2011 Sprint Cup chase extremely pessimistic. After all, Tony Stewart went into the chase saying he thought the team was wasting a chase berth with the way they had been performing. Of course we all know what happened; Tony Stewart went on a tear- won FIVE of the ten Chase races (something that had NEVER been done before) including the season closer at Homestead-Miami, thus winning the Chase by TIEBREAKER. It was both exhilarating and stressful to be a Tony Stewart fan towards the end of the 2011 chase. I was AT the Phoenix race and spent most of the race perched on the patio of the media center- watching the race through my fingers. I don’t even remember much about the Homestead race- except that I was so stoked that I promised my family that if Tony won the championship I would treat them to dinner at the Outback. Guess you all know what I had for dinner that night. What made the chase so great last year- especially during Homestead was that it was so CLOSE- and to win it Tony Stewart HAD TO WIN THE RACE- a second place wouldn’t cut it. This year however, I feel EXCITEMENT going into the chase because this year NASCAR’s Chase for the 2012 Sprint Series Cup could be brought home by ANY of the 12 drivers. I personally do not count ANYONE out. Sure Tony’s the reigning champion and I would LOVE to see him become a FOUR time champion. Denny Hamlin goes in to the Chase seeded first and his crew chief Darian Grubb no doubt feels he has a point to prove. But I can’t count out Jimmie Johnson- he’s won five and is looking hard for 6. With FOUR of the 12 cars being Hendrick Motorsports cars that means mathematically (and I am NOT good at math people) there is a 1/3 chance that winner could be a Hendrick car- and Junior has been looking strong and CONSISTENT all season. And Jeff Gordon has been driving like a maniac (in a good way) these last few races. And Kasey’s had some bad luck but pretty much had that first Wild Card spot in the bag in Richmond. Kenseth no doubt would like to leave the 17 team with a Championship before jumping over to Joe Gibbs Racing next season. Harvick is tenacious and they didn’t give him the nickname THE CLOSER for anything. Then we have dark horses like Greg Biffle, Martin Truex Jr and Clint Bowyer who have also been RIGHT there all season long. And I would NEVER ever ever count out Brad Keselowski. In my mind- right before we go into the first race of the Chase it is ANYONE’s trophy right now. As a NASCAR fan, the fact that it is anyone’s championship right now is EXCITING. Of course I still want Tony Stewart to win it! Who do YOU think will win it all? Giveaway: Coca-Cola / Carmike Cinemas Gift Basket!! As you probably know there are several #NASCAR drivers that are members of the Coca-Cola racing family- including our beloved Tony Stewart (and fellow Stewart-Haas Racing Drivers Ryan Newman and Danica Patrick)! But did you know that Carmike Cinemas have these really cool collector cups featuring Coca-Cola Family Drivers TONY STEWART, Ryan Newman, Danica Patrick, Jeff Burton and Greg Biffle? They do! These awesome looking cups can be purchased at the theater concession stands starting August 1st 2012 (what a great excuse to go to the movies right?) and will be available until September 30th OR until the cups run out! You will want to get thee to a theater as soon as possible to get one (I tell you I WISH I lived in an area with these theaters because I would be there on August 1st to make sure I got a Tony Stewart cup or three!). And along with your uber cool Coca-Cola collector #NASCAR cup you also have the chance to enter for a trip to the Daytona 500 (WHOO HOO!)! So be sure to head over to your local Carmike Cinema starting August 1st to get your #NASCAR Coca-Cola Racing family cup! If you LIKE the Carmike Cinema Facebook Page they have a great little ap for you to look up movie times that is super handy! GIVEAWAY: To announce the Coca-Cola Racing Family cups- I have been given a GREAT Coca-Cola/Carmike Gift Basket for you to win! The basket includes 4 of the Coca-Cola #NASCAR driver collectible cups, a Coca-Cola t-shirt and cooler, 2 Carmike Cinemas movie passes and a $50 AMEX gift card! What an awesome gift basket! You could win this Coca-Cola Carmike Gift Basket that includes: 4 of the Coca-Cola #NASCAR driver collectible cups, a Coca-Cola t-shirt and cooler, 2 Carmike Cinemas movie passes and a $50 AMEX gift card! To enter just leave a comment on this post with your favorite movie or a movie you are looking forward to seeing! It’s easy as that. To enter you can leave a comment on this post that includes your valid email address so that I may contact you if you are the winner. As the winner you agree to provide a current shipping address so that your gift basket may be sent to you! You must enter before Midnight Pacific Time August 10th, 2012! Winner will be chosen at random from all entries via website and twitter. There will be only one winner! General disclosure: The prize was provided by Coca-Cola. Neither Coca-Cola nor its program partners (NASCAR + Carmike Cinemas) are sponsors, administrators, or involved in any other way with this giveaway. All opinions expressed in the post are my own and not those of The Coca-Cola Company or aforementioned partners. Winner to be chosen by Bad Groove. Official Small Business of NASCAR Finalists Announced! Congratulations to the two finalists in this year’s 2011 “Official Small Business of NASCAR, Courtesy of Office Depot” Sweepstakes. 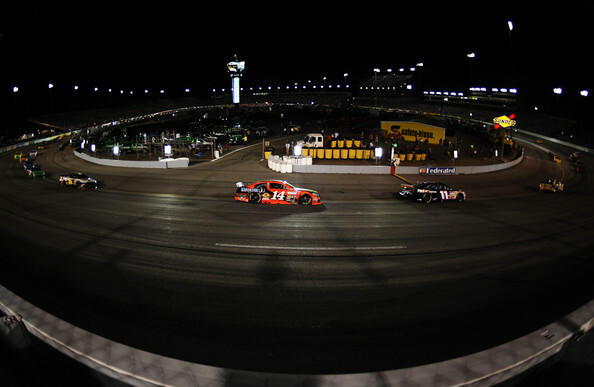 Two great finalists will race (vicariously via Tony Stewart and Greg Biffle) for the title this weekend at the AvoCare 500 at Atlanta Motor Speedway this Sunday! The paint scheme is one of many running under the “Honoring Our Heroes” program which is a partnership with Lionel NASCAR Collectibles and the Stephen Siller Tunnel to Towers Foundation. A portion of the proceeds from merchandise sales from all of the “Remembering Our Heroes” merchandise will be donated to the Stephen Siller Tunnel to Towers Foundation, which children who have lost a parent, firefighters, and military who have been seriously injured and sacrifice their quality of life in the line of duty. Other drivers carrying themes under this banner are: Danica Patrick, David Gilliland, Greg Biffle and Jamie McMurray. The diecast is already available through pre-orders. There is a reason I don’t collect diecasts: I would be the type of collector that would have to have every variation of every paint scheme out there…and my bank account would never have any money in it. EVER. And Roxy kind of likes to eat. And frankly so do I. But with a portion of the proceeds going to a wonderful cause, how can I not add this special paint scheme to my collection? You can too here. For more information on the paint scheme, other drivers running similar schemes and the partnership between Lionel NASCAR collectibles and The Stephen Siller Tunnel to Towers Foundation visit here. 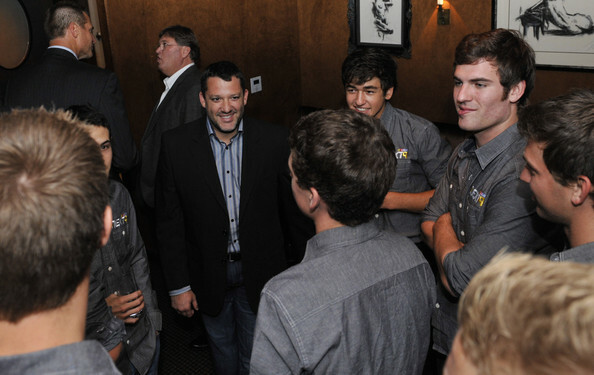 Tony Stewart Tidbits with Pictures!